Style #T3428 We've created an adorable new moisture-wicking tank top pajama set available in a variety of beautiful colors. 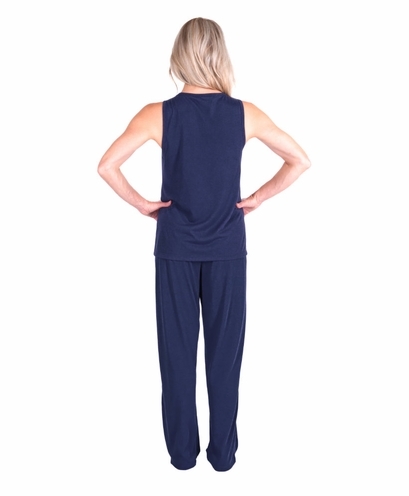 The women's cooling pajamas set includes a gathered bodice tank top with a long drawstring pant for an attractive new look. 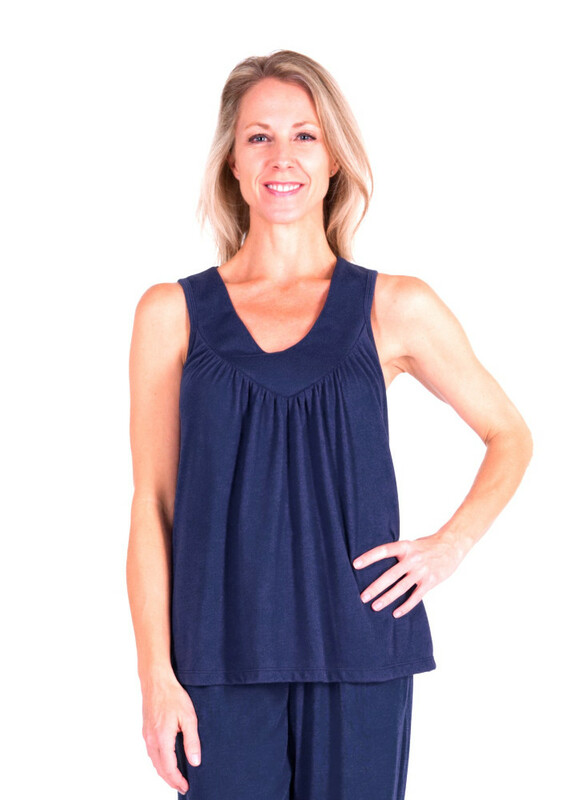 The gathered tank features sleeveless v-neck styling and the pant has a comfortable elastic waist with added drawstring closure and convenient side seam pockets. 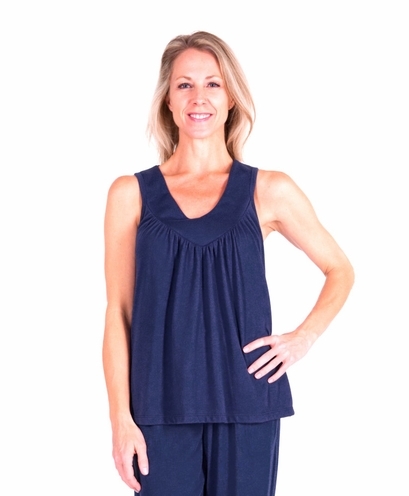 Our quick drying, silky soft, moisture-wicking tank top pajama set is perfect for travel or hot nights. Every Cool-jams garment uses our smart fabric technology for a super soft, cotton-like hand feel with integrated wicking technology that never washes out. The wicking fibers are scientifically woven into the fabric itself along with technology that inhibits the growth of odor causing bacteria keeping Cool-jams fresh and odor free. Pant inseam length 30". Note: The colors Violet and Turq-Sea are being closed out, so stock is limited in these colors. Moisture-wicking tank top pajama set weight approximately 11 oz. Wash your moisture-wicking tank top set in cool or warm water on gentle cycle. Never use fabric softener or fabric softener sheets because it will minimize the wicking properties of the fabric. If you accidentally use fabric softeners, re-wash the women's cooling pajamas in clear water to remove softener residue, so the wicking properties will return to maximum effectiveness. Lay your garment flat or hang to dry. 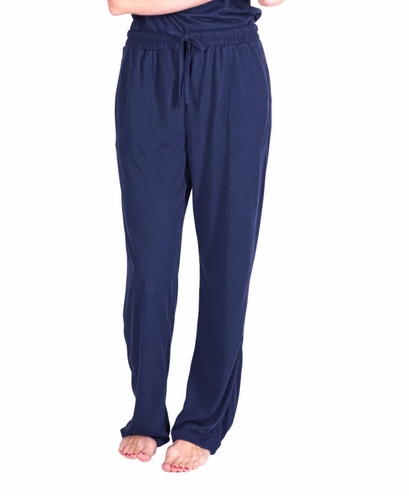 Tumble drying won't damage the moisture-wicking tank top pajama set, but can sometimes create static. I really like the fit and comfort of this set. It is very light. I was disappointed though, I though the bottoms had pockets as I had read in the decription and I would not say that I am cooler at night. I still really like these and plan on ordering the light weight robe. These jammies are nearly perfect for me. Except the arm holes could be a little larger. They don't cut but just feel a little too small. Mind you I'm a slender person!! So happy that the pants are just the right length and the elastic is just right. Love the PJs but the pockets are annoying. Because of the silkiness of the material I found that the pockets kept turning themselves inside out during the night and forming an uncomfortable lump against my hip. Do I really need pockets in my PJs? No. 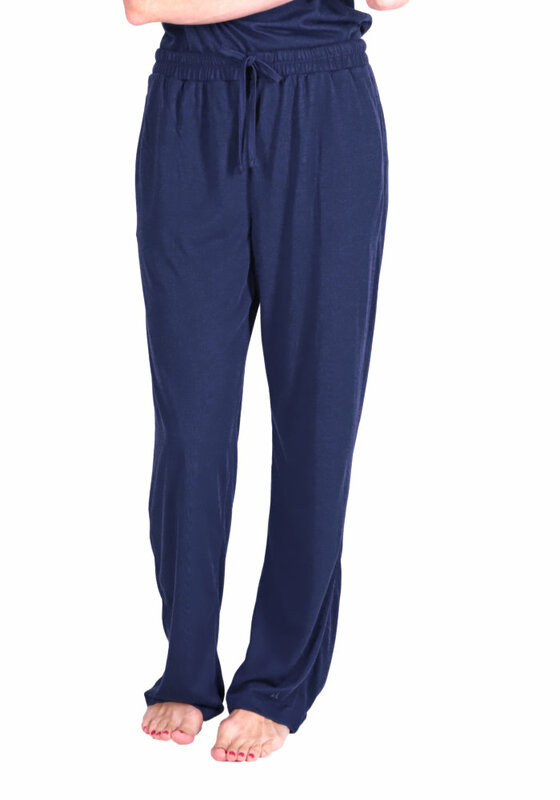 Merchant's comment: Great news...we will be removing pockets from our PJ pants for future shipments. Thanks for letting us know. Also we have lots of pjs without pockets. Try our Kristi pajama set and our new pleated pajama sets.